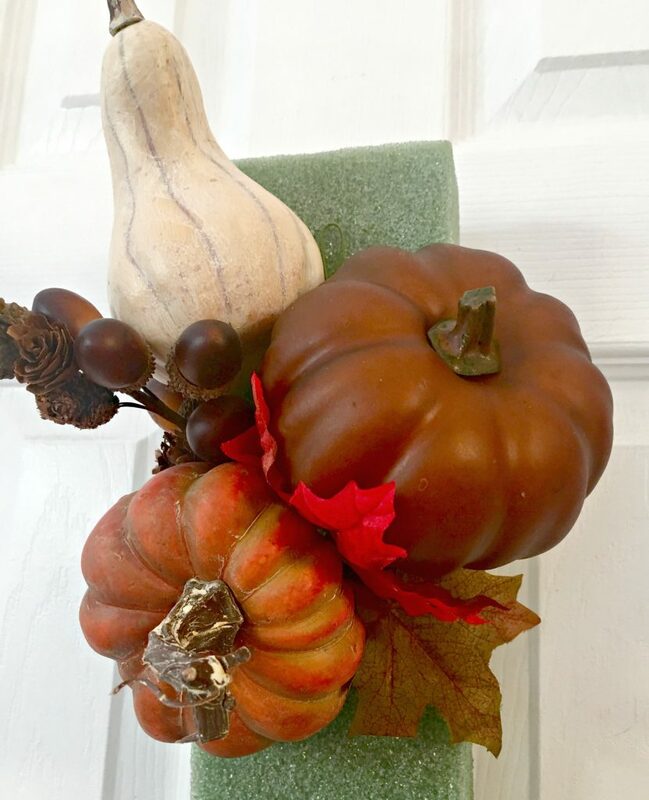 If you will be welcoming guests for Thanksgiving, this DIY Fall Swag is the perfect way to greet them as they arrive. 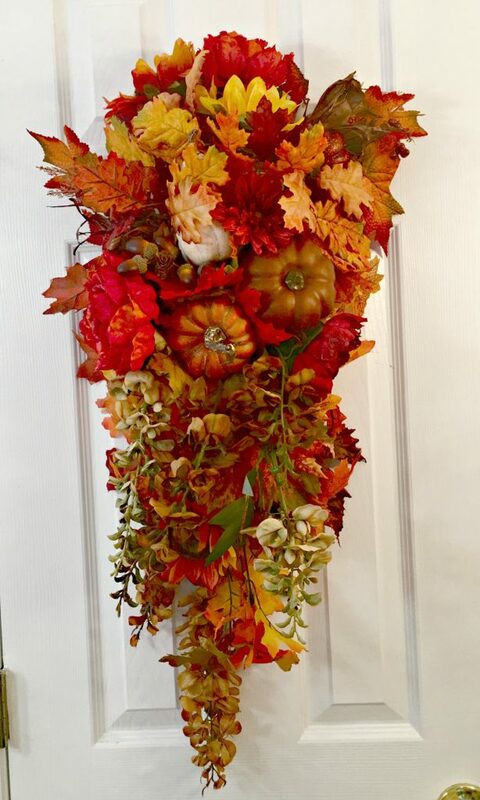 Here is a step by step tutorial for how to add this to your entryway. Begin with a block of styrofoam that is about 2″ x 4″ x 11″. This will be the base for your swag. The first step to making your swag is to give yourself a hanger to hang it from the door where you will be displaying it. 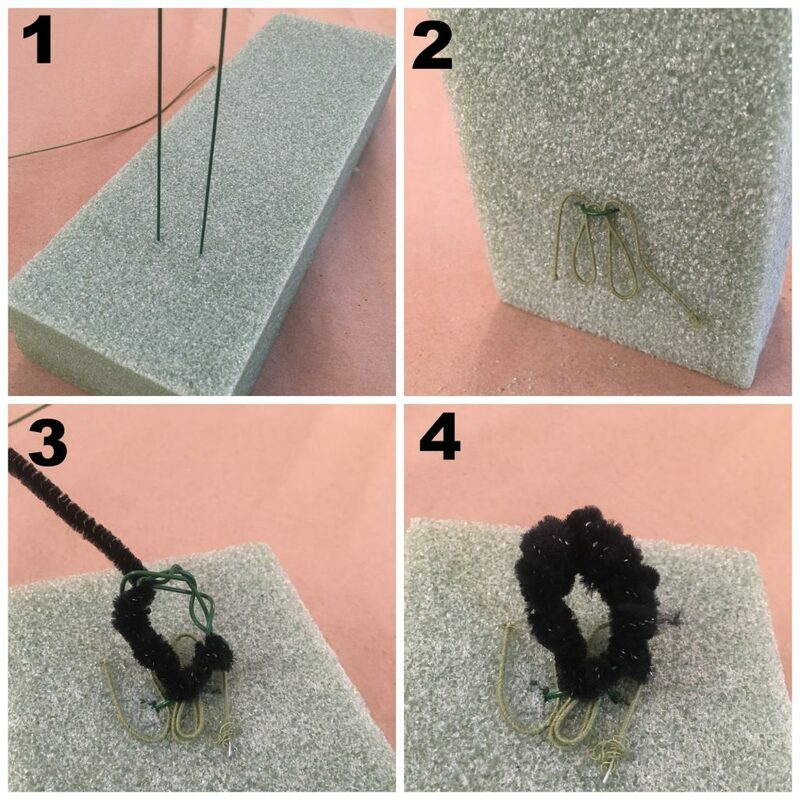 Using an 18 gauge floral wire, bend it in half and stick it through your piece of styrofoam. Before pulling it all the way through, you must secure the wire with something to keep it from cutting and being pulled all the way through your foam block. I like to use a piece of paper wrapped wire in a “W” or “M” pattern that will keep the wire from pulling through. On the back side of the foam, wind your wire into a circle to hang on your hook. To protect your door, wrap the wire in a pipe cleaner. 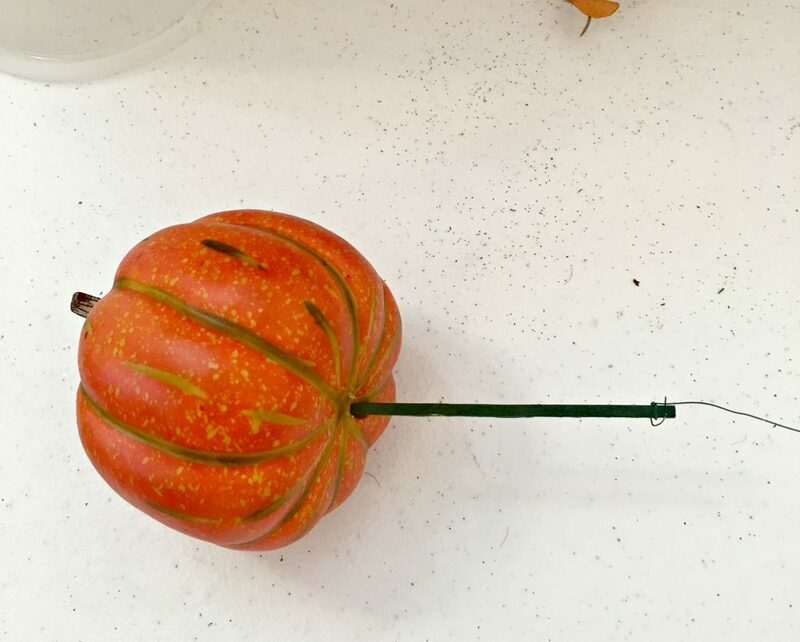 Using some small pumpkins and wood sticks, puncture the pumpkins and push the stick into the styrofoam. 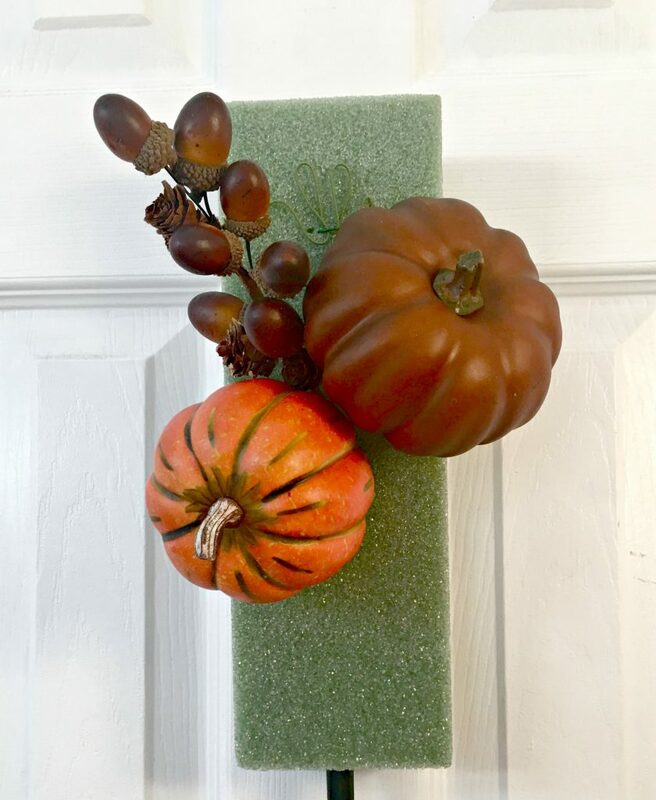 I repeated this with another pumpkin and a pick of faux acorns. This will be my focal point in the swag. 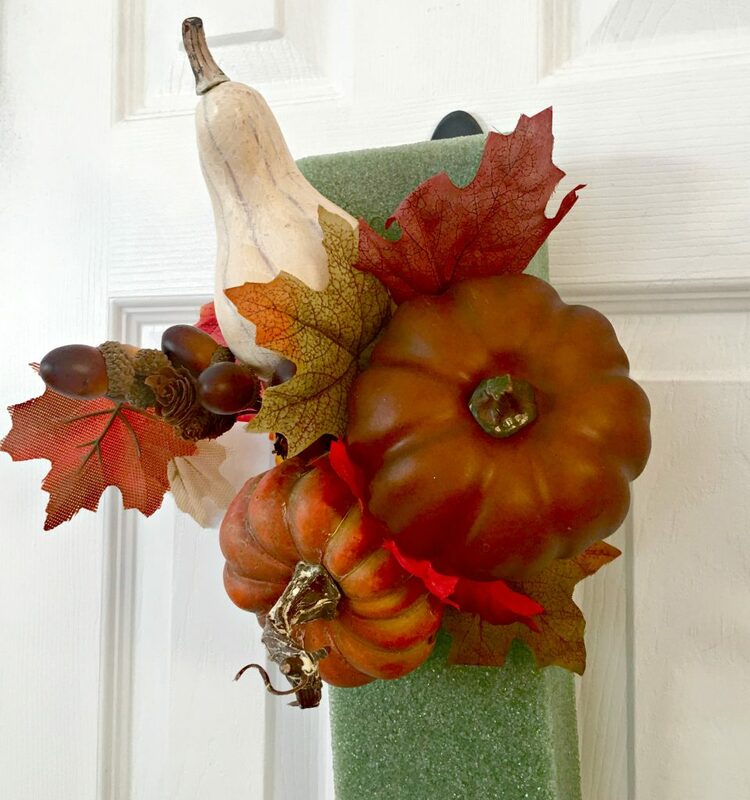 I added a gourd and began to tuck some fall leaves amongst my larger pieces. 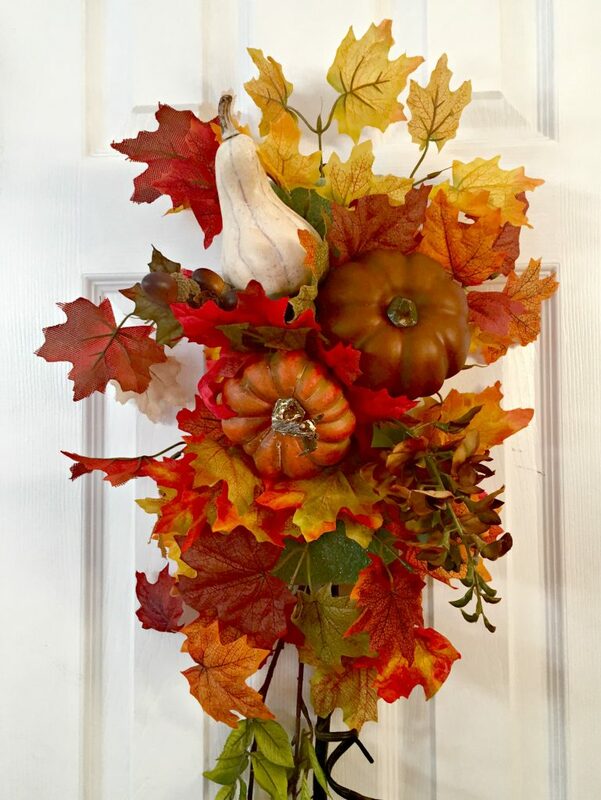 I used fall leaf picks from the Dollar Tree and cut them apart into individual stems. Continue to tuck leaves in all around the featured items on your swag. 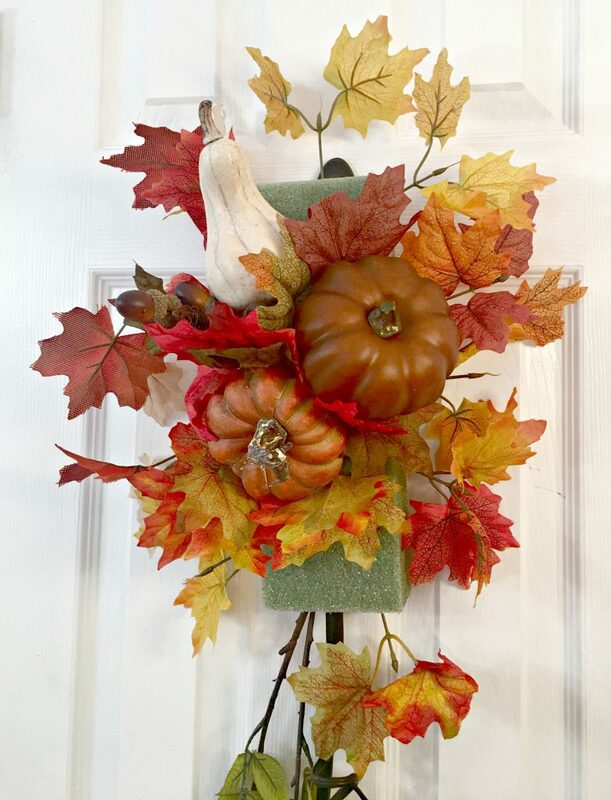 Continue to fill in the swag with fall leaves, you will save your fall flowers to top your swag. Begin to add flowers, with longer blossoms first. I added some fall colored wisteria to hang down in my swag. You can see the wisteria more in this photo. (Ignore the dark grapevines, I decided to remove them later.) The swag is almost complete with the addition of a number of fall faux blossoms. This shows the swag needs to be a little rounder at the top and I needed to remove the grapevines from the bottom. Here you can see how the top was rounded out with fall blooms and the bottom was shortened and the vines removed. 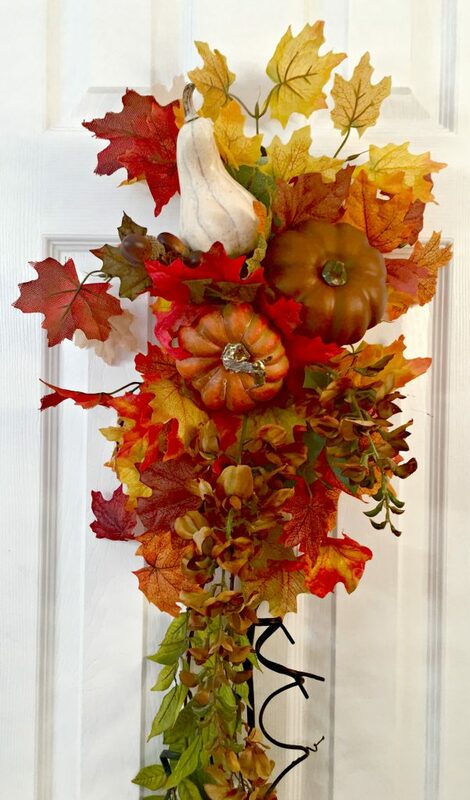 Your fall swag is ready to hang on your door and greet guests as they arrive! 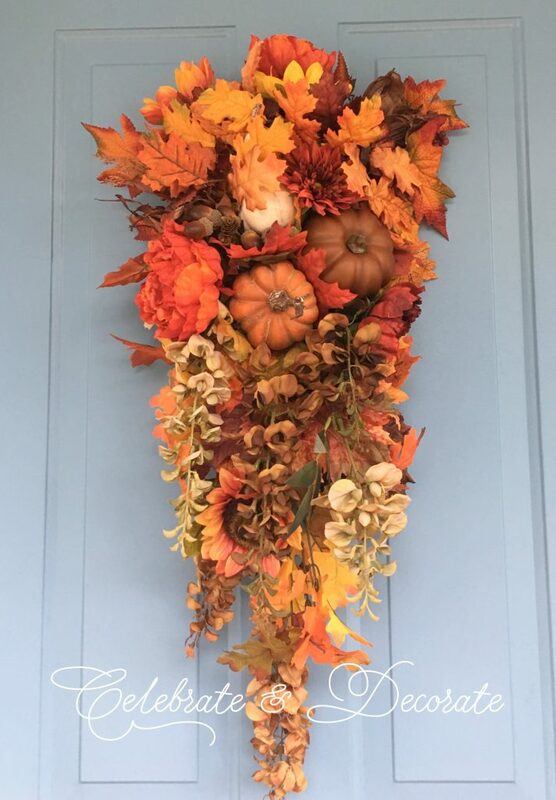 The autumn colors look fantastic on my blue door! I couldn’t be happier! 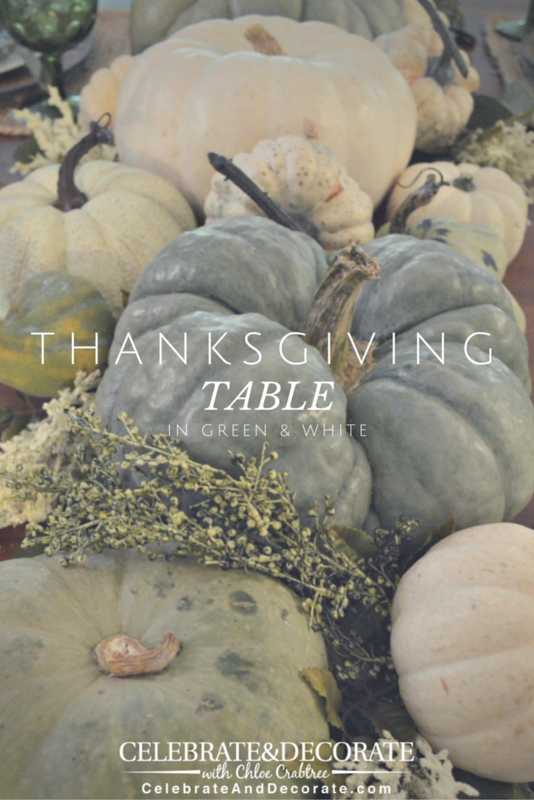 This is the perfect way to greet guests for Thanksgiving! The fall swag looks beautiful! I think I am going to try to make it but I needed to know how to finish the back off in case I decide to sell it? I don’t think I want to sell it with just a block of styrofoam showing but don’t know what to do with it? Thank you Jennie! I use ribbon on the back to cover the styrofoam. 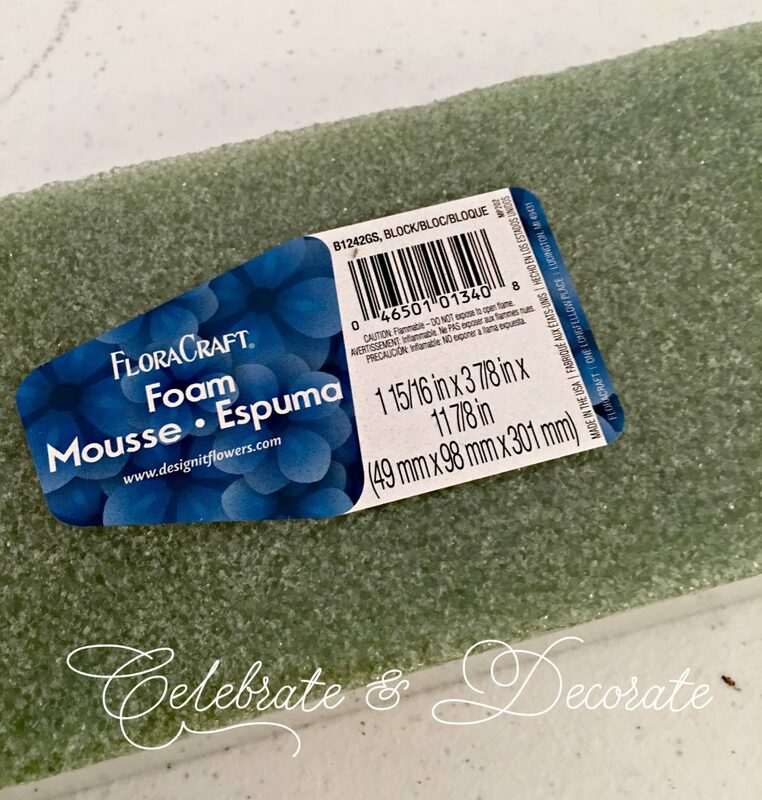 You can use craft glue on the styrofoam and then I also use some “s” pins to secure the edges of the ribbon. Does that make sense? If you need some photos, let me know and I can send them to you. I usually use two pieces of ribbon, one on each side of my hanger. Chloe, love the autumn swag. My door is blue also, so this would be perfect at my home! Thank you Pam! 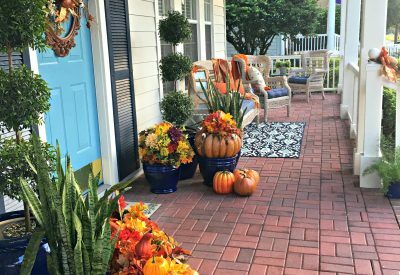 I am going to decorate my porch and front door in browns and blues for fall this year! Looks beautiful Chloe! I love your step by step showing corrections and additions. Thank you Kari! Yes, it doesn’t always turn out right the first time! Thank you Cindy, I am glad I have inspired you! 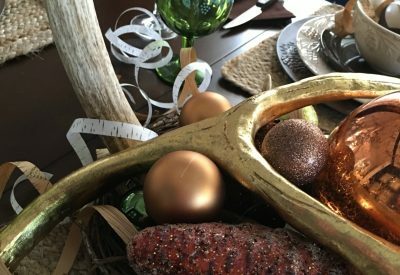 I am always taking apart last year’s decorations and re-styling them for a new look! Thank you Kimberly! Thanks for pinning, too! Send me a picture of yours! Do you have any ideas for a door with a storm door in front of it? Not as much space? I will think about this Sandy, I think a sign is a great idea, but it would be nice to enhance it a little, wouldn’t it? Oh, thank you so very much Kari! You are so very kind! I think I know what your wire heart looks like, I am thinking to incorporate it into a swag would be a good idea. Keep an eye out, I will try and style a swag with a wire heart. God bless you, what a tragedy to lose a sweet angel. Sending hugs and prayers your way. I like the swags more than wreaths and now just have to figure out where to store them. You are a wealth of ideas and inspiration! Thank you Sandra, I like them better, too! I am lucky I have high ceilings, so I have a number of nails up high in a spare closet to hang them on. 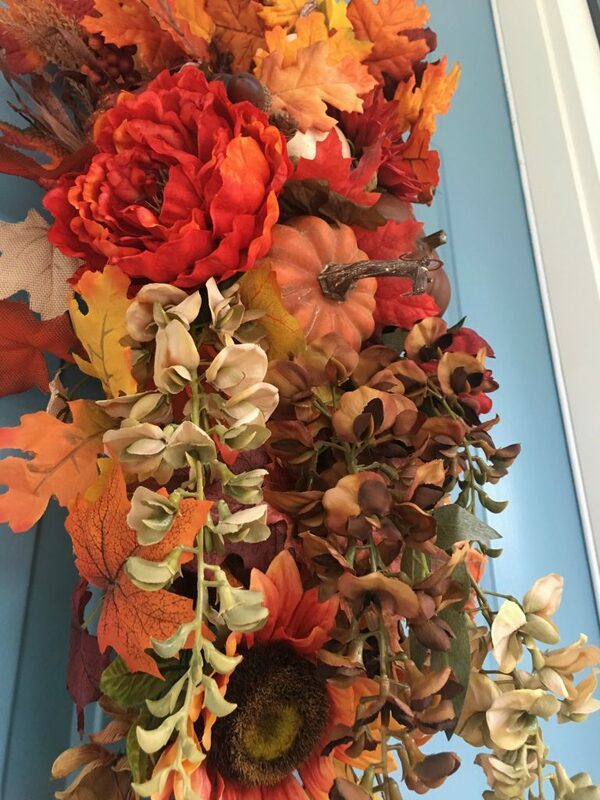 Don’t you love decorating for fall with the lovely colors? Your swag is pretty and thanks for sharing with us. I just finished making a long one to go over my front door. Happy Fall Y’all from S.C. Yes, I do love the fall colors, Lynda! I made a long swag for over my front door, too. I changed my Facebook cover photo to feature it! Alas, we had our house painted this year and my husband has requested chocolate brown and blue for fall so I will be moving these couple of pieces to my Mom’s! Thanks for taking the time to stop by and say hi and leave a comment! I just love everything you make and you are a great teacher. I’m a neighbor of yours well almost, I live in zephyrhills FL just west on i4. Please keep sharing I look forward to all your post. I love watching you when I get the time. Have always wanted to make a swag but didn’t know where to start or begin. But watching you mad it look easy so I gave it a try. I don’t think I did to bad but I don’t know. Will keep practicing cause I get tired of making just wreaths. Thank you Margaret! I love making swags, I think I could make one every single day! They are a nice change from a wreath! Thanks for watching and letting me know you enjoy it, that means the world to me!! Thank you so much Leah! 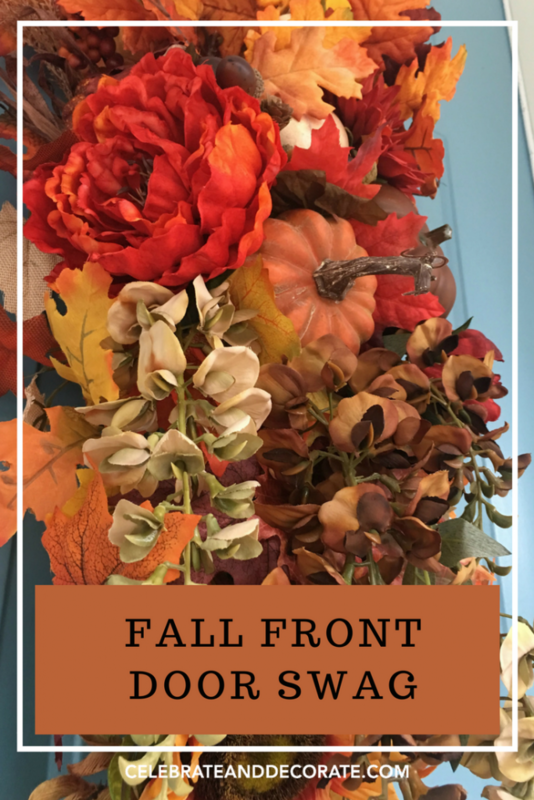 I know I will enjoy getting into Fall decor, but I know summer is so short and sweet! This is just beautiful. It can also be used indoors as well, which is my plan for my dining room wall. Thanks for the step by step! 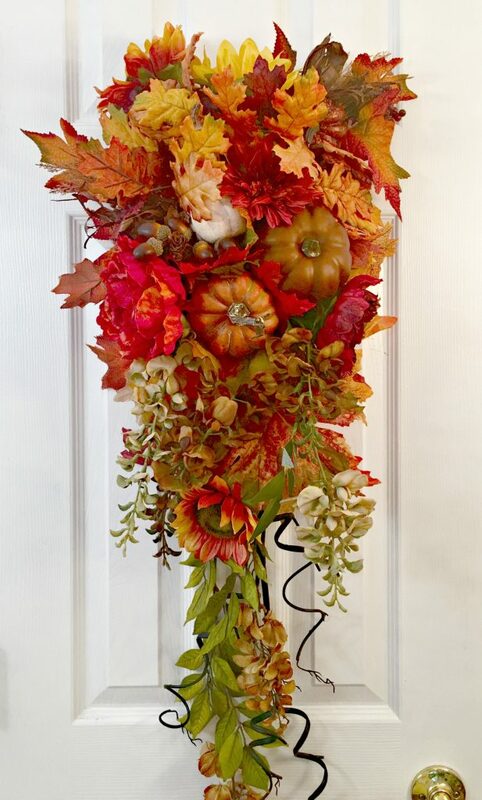 What a pretty way to welcome guests into your home.